Autophagy is a degradative pathway that plays an essential role in maintaining cellular homeostasis. Most early studies of autophagy focused on its involvement in age-associated degeneration and nutrient deprivation. However, the immunological functions of autophagy have become more widely studied in recent years. Autophagy has been shown to be an intrinsic cellular defense mechanism in the innate and adaptive immune responses. Cytokines belong to a broad and loose category of proteins and are crucial for innate and adaptive immunity. Inhibitory cytokines have evolved to permit tolerance to self while also contributing to the eradication of invading pathogens. Interactions between inhibitory cytokines and autophagy have recently been reported, revealing a novel mechanism by which autophagy controls the immune response. In this review, we discuss interactions between autophagy and the regulatory cytokines IL-10, transforming growth factor-β, and IL-27. We also mention possible interactions between two newly discovered cytokines, IL-35 and IL-37, and autophagy. Autophagy is an essential cellular pathway that contributes to homeostasis by degrading a variety of intracellular components [1, 2]; in particular, toxic protein aggregates, dysfunctional organelles, and invading pathogens [3-7]. Three major autophagy pathways have been described that vary in the method of cargo delivery: macroautophagy, microautophagy, and chaperone-mediated autophagy . Macroautophagy is characterized by formation of intracellular double-membrane structures known as autophagosomes. A large body of evidence has confirmed that macroautophagy is a selective process and requires a variety of autophagy-related proteins (ATG) for the initiation, maturation, and termination of the process [9, 10]. In this review, we will discuss only macroautophagy (hereafter referred to as autophagy). Most early studies of autophagy focused on its involvement in age-associated degeneration and nutrient deprivation. However, in recent years, there has been a dramatic increase in studies of the immunological functions of autophagy. Thus far, autophagy has been shown to be an intrinsic cellular defense mechanism that protects against invading pathogens, such as viruses and bacteria. Abnormal autophagy appears to be linked to a wide spectrum of human disorders, including autoimmune disease, infection, sterile inflammation, and even neoplasms. Cytokines belong to a broad and loose category of proteins and are crucial for both innate and adaptive immune responses. Inhibitory cytokines have significant functions in immune defense, as they have evolved to permit tolerance to self while also contributing to the eradication of invading pathogens. Interactions between cytokines and autophagy have been described in several recent articles that shed light on a novel mechanism for controlling the immune response. In this review, we will mainly discuss the interactions between autophagy and three regulatory cytokines: the conventional inhibitory cytokines IL-10 and transforming growth factor (TGF)-β, the newcomer IL-27. We will also speculate on the possible interactions between IL-35 and IL-37 and autophagy, which to date remain only theoretical. The autophagy pathway. Autophagy consists of sequential steps involving vacuole initiation, nucleation, elongation, closure, fusion, and degradation. Initiation occurs as a response to multiple potential autophagic stimuli. Nucleation is characterized by formation of an autophagic phagophore in the cytoplasm. During the elongation and closure stage, a double-membrane autophagosome develops into its mature form and fuses with a lysosome to become an autolysosome. This is followed by lysosomal degradation of the autophagic cargo. The autophagy pathway requires the orchestrated assembly of multiple ATG proteins into functional complexes . Briefly, autophagy consists of sequential steps involving vacuole initiation, nucleation, elongation, closure, fusion, and degradation (Fig. 1). Initiation is triggered by the cellular response to multiple potential autophagic stimuli and is mediated mainly by the Unc-51-like kinase 1 (ULK1) complex. This complex is composed of ULK1, ATG13, FIP200, and ATG101 and is regulated by mammalian target of rapamycin (mTOR) [11-14]. At the nucleation stage, an isolated membrane structure known as an autophagic phagophore (autophagosome) is formed in the cytoplasm . The key modulator of nucleation is the Beclin-1-class III phosphatidylinositol 3-kinase (PI3K) complex, which is composed of vacuolar protein sorting 34 (Vps34), ATG14, and Beclin-1. The principle function of this complex is to recruit lipids and proteins to the phagophore and thus promote membrane formation . The UV irradiation resistance-associated gene (UVRAG) promotes trafficking of the Beclin-1-class III PI3K complex and ATG9 . The endoplasmic reticulum, Golgi apparatus, and mitochondria can all be sources of the phagophore membrane [16-18]. At the elongation and closure stage, the phagophore can be visualized as a double-membrane structure that develops into a mature autophagosome . Two ubiquitin-like conjugation systems facilitate elongation of the phagophore; namely, the Atg12-Atg5-ATG16L and Atg4B-Atg3-Atg7 complexes [19, 20]. Atg7 and Atg3 [21, 22] facilitate conjugation of the cytosolic form of LC3 to phosphatidylethanolamine (PE), thereby converting it into the membrane-binding form LC3-PE. The Atg12-Atg5-ATG16L complex specifies the site of LC3 binding to the membrane and facilitates recruitment of other components of the autophagy machinery to sites of autophagosome formation [23, 24]. P62 (also known as sequestosome or SQSTM1) is an ubiquitin-binding protein that participates in this process, and changes in p62 levels can be used as an autophagic flux marker . Endophilin B1 interacts with Beclin-1 through UVRAG to positively regulate and facilitate autophagosome formation . 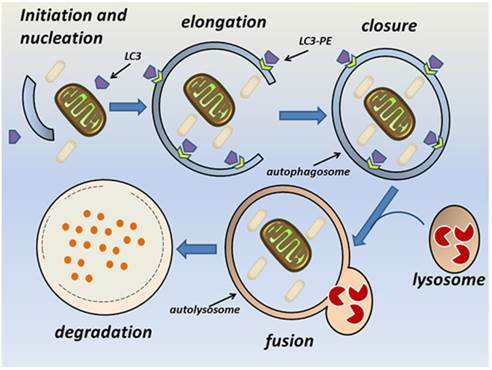 At the fusion stage, the mature autophagosome fuses with a lysosome to form a single membrane-bound autolysosome through the interaction of syntaxin 17 and the homotypic fusion and vacuole protein sorting complex [27-29]. The fusion stage is followed by acidification of the lysosome and degradation of the autophagosome contents . Several studies have demonstrated that autophagy is regulated by multiple immunological signals, including pattern recognition receptors (PRRs) [30, 31], mTOR , AMP-activated protein kinase , and high mobility group box-1 protein . Additionally, pro-inflammatory cytokines, including IL-1β , interferon (IFN)-γ [35-37], and tumor necrosis factor (TNF)-α , stimulate autophagy, whereas Th2 cytokines, such as IL-4 and IL-13, inhibit autophagy . The innate immune system induces an inflammatory response that protects the host against microbial invasion. Multiple classes of PRRs, including Toll-like receptors (TLRs), nucleotide-binding oligomerization domain (NOD)-like receptors (NLRs), and retinoic acid-inducible gene (RIG-1)-I-like receptors (RLRs), have been shown to induce autophagy at different stages of the immune response. For example, TLR2, TLR3, TLR4, TLR7, and TLR8 all activate innate immune cells , and TLR stimulation can induce autophagy, which contributes to the anti-microbial response . Conversely, autophagy can stimulate TLRs by transporting microbe-derived cytoplasmic pathogen-associated molecular patterns (PAMPs) to the endosomal lumen, where they activate TLR signaling . A relationship between NLRs and autophagy has been revealed in mammals. NOD1 and NOD2 recruit ATG16L1 to the pathogen-entering site at the plasma membrane  and thus induce defensive autophagy. NLRX1 promotes the formation of ATG5-ATG12-ATG16L1 complexes . In contrast, NLRP4 negatively regulates autophagy through its interaction with Beclin-1; consistent with this, RNA interference-mediated blockade of NLRP4 enhances autophagy under physiological conditions and during invasive bacterial infections . NLRP4 also inhibits maturation of the autophagosome by associating with the class C vacuolar protein sorting complex . RLR signaling also interacts with autophagy. Atg5 deficiency augments RLR stimulation, most likely via increased intracellular levels of reactive oxygen species (ROS) . The Atg5-Atg12 conjugate interacts with caspase recruitment domains of RIG-I and mitochondrial antiviral signaling and thus inhibits IFN induction . However, a downstream component of RLR signaling, stimulator of IFN genes, has been reported to activate TANK-binding kinase 1 and type I IFN production, which induces autophagy [47-49]. Autophagy also supplements the anti-microbial barrier function of conventional PRRs by mediating clearance of cytoplasmic pathogens through sequestosome-1/p62-like receptors (SLRs) [50-52]. Accumulating evidence indicates that autophagy suppresses activation of inflammasomes [53-55], which are expressed in myeloid cells and are the components of the innate immune system. For example, a lack of functional ATG16L1 increases the secretion of IL-1β and IL-18 . Damaged mitochondria are an important source of inflammasome agonists, particularly mitochondrial DNA and ROS [55, 57]. Mitophagy is a specialized form of autophagy that removes aging and dysfunctional mitochondria and thus limits inflammasome activation . Upon recognition by p62, inflammasomes are selectively degraded through autophagy, decreasing the production of IL-18 and IL-1β. The latter cytokine can be directly degraded in autolysosomes . Previous work has demonstrated that cytosolic lipopolysaccharide (LPS) activates non-canonical inflammasomes and induces the production of IL-1α and/or IL-1β and IL-18 . Autophagy eliminates bacteria-containing vacuoles by lysosomal degradation and thus inhibits activation of such non-canonical inflammasomes . Recent work has provided insight into the role of autophagy in antigen-specific immune responses. In antigen presenting cells (APCs), autophagy degrades pathogen-derived antigens into peptides and transports them from the cytoplasm to major histocompatibility complex (MHC) compartments where they are assembled with MHC class II molecules [60-62]. Induction of autophagy or association of antigens with autophagosomes enhances MHC class II-mediated presentation of intracellular antigens to CD4+ T cells [63-65]. In addition to endogenous antigens, exogenous antigen presentation by MHC class II is promoted by autophagy via PRR-stimulated LC3-associated phagocytosis , in which LC3 binds to phagosomal membranes conjugated to TLR2, TIM4, Fc receptors, or dectin-1-bound cargo [67-70]. In contrast, autophagy may play dual roles in MHC class I-mediated antigen presentation because although it can limit protein degradation by proteasomes , it may also contribute to antigen presentation during herpes simplex virus type 1 or human cytomegalovirus infections [72, 73]. Autophagy is required for the unconventional pathway of MHC class I-mediated antigen presentation; namely, cross-presentation [72, 74]. Autophagosomes process and degrade protein antigens into peptides, which are assembled with MHC class I molecules in the endoplasmic reticulum . Changes in autophagosome maturation can result in autophagic exocytosis, which might contribute to antigen processing and facilitate cross-presentation [75, 76]. In addition to promoting antigen processing, autophagy can regulate adaptive immunity via effects on the development, homeostasis, and function of T cells. After leaving the thymus, naive T cells rely on autophagy and mitochondrial quality control for further maturation . In activated T cells, not only is autophagy increased by CD3 and CD28 co-stimulation , it is also required for cell survival . Furthermore, autophagy seems indispensable for the expansion of lymphocyte populations and maintenance of memory [80-82]. Autophagy is also necessary for the survival of B1 cells  and plays an important role in plasma cell antibody secretion, survival, and homeostasis . IL-10 is an immunomodulatory cytokine that plays an essential role in maintaining immune homeostasis . Binding of IL-10 to its receptor activates Janus kinase 1 and Tyk2, which phosphorylate signal transducer and activation of transcription (STAT)1 and STAT3 [86-89]. The phosphorylated STATs then translocate to the nucleus where they regulate the expression of many key genes involved in cytokine production . IL-10 inhibits both the innate and adaptive immune responses, and it decreases the ability of monocytes and macrophages to produce a variety of pro-inflammatory cytokines . IL-10 affects the expression of matrix metalloproteinase-9, inducible nitric oxide synthase, and IFN, and induces production of miR-187, a microRNA that reduces the stability of pro-inflammatory cytokines, including TNF-α . Moreover, IL-10 interferes with IFN-γ-induced activation of monocytes  and cathepsin S expression in macrophages , hampering MHC class II formation and antigen presentation . It also suppresses macrophage function by inhibiting nitric oxide production and is essential for the immunosuppressive function of Tr1 cells . In various subsets of CD4+ T cells, including Th17 and Th1 cells, IL-10 plays regulatory roles through self-regulation and through control of Tregs . In the innate immune response, IL-10 directly suppresses TLR signaling and activates the PI3K-Akt-GSK signaling pathway, which is involved in suppression of inflammatory genes . TGF-β plays a key role in regulating the inflammatory response and maintaining immune homeostasis. TGF-β binding to its receptors induces phosphorylation of Smad2 and Smad3, which elicit diverse cellular actions [98, 99]. Inhibitory Smad7 acts as a negative regulator of TGF-β signaling . In different cell contexts, TGF-β activates a variety of Smad-independent signaling pathways, including PI3K, mitogen-activated protein kinase (MAPK), Rho family proteins, the epithelial polarity protein Par6, and PP2A phosphatase [101, 102]. TGF-β regulates the proliferation, differentiation, and survival of a number of immune cells; for example, it downregulates T cell activation at the level of T cell receptor signaling, and its suppression of Th1 polarization is important in preventing Th1-mediated colitis [103, 104]. TGF-β also downregulates CD8+ T cell proliferation and cytotoxic activity [105-108] and promotes generation of induced Tregs [109-115]. In the presence of retinoic acid, TGF-β converts CD4+ T cells into Tregs [116-121]. The effects of TGF-β on Th17 cell differentiation are controversial. Several reports using various methods of TGF-β signaling blockade have revealed important effects of TGF-β on Th17 differentiation [122-126]. However, deletion of Smad2, Smad3, or Smad4 in T cells failed to impair Th17 development [127-129]. TGF-β suppresses NK cell cytolytic activity by inhibiting NKp30 and NKG2D receptors [130, 131], and exogenous administration of TGF-β suppresses B cell proliferation and antibody secretion [132, 133]. TGF-β1 blocks nuclear factor (NF)-κB activation in TLR-stimulated macrophages by facilitating the proteasomal degradation of MyD88 . In dendritic cells (DCs), TGF-β downregulates pro-inflammatory cytokines, including TNF-α, IL-12, and IFN-α, but upregulates regulatory cytokines, including TGF-β itself [135, 136]. IL-27 is an immunomodulatory cytokine expressed mainly by APCs stimulated with microbial products or inflammatory mediators [137-139]. Tregs, IFN-γ, and statins can induce IL-27 production by APCs. Binding of IL-27 to its receptor (IL-27R) induces STAT1 and STAT3 activation [139, 140]. IL-27 plays a complex role in immunoregulation as it has pro-inflammatory and anti-inflammatory effects on many cell types, including T cells, B cells, macrophages, and DCs . The effects of IL-27 on Th1 cells are controversial and may be context dependent. IL-27 was reported to promote the induction of Th1 differentiation [142, 143]. However, in Il27ra-/- mice, Th1 responses are sufficient to eliminate intracellular pathogens . IL-27 suppresses expression of the transcription factors RORγt  and RORα , the granulocyte-macrophage colony-stimulating factor (GM-CSF) , and the Th2-specific transcription factor GATA3[148, 149]. IL-27Rα-deficient mice are more prone to intracellular pathogen infection than wild-type mice [143, 150, 151]. In the experimental autoimmune encephalitis mouse model of human multiple sclerosis, IL-27 downregulates the differentiation and development of Th17 cells and lowers the incidence and severity of the disease[152-154]. IL-27 promotes the differentiation and expansion of Tr1 cells by inducing the transcription factor c-Maf, IL-21, and costimulatory receptor ICOS , and thus enhances the production of inhibitory IL-10 [156, 157]. Finally, IL-27 reduces Fork head box 3 (Foxp3) expression in inducible Tregs  and antagonizes their generation by TGF-β and IL-2 [159, 160]. Further research will be necessary to investigate how the pro-inflammatory activity of IL-27 in limiting Tregs is balanced by its anti-inflammatory activity in inducing IL-10. IL-35 is an anti-inflammatory and immunosuppressive cytokine  expressed by thymus-derived nTregs, peripheral iTregs, and DCs [162-165]. Another important source of IL-35 is iTr35 cells, a population of CD4+ Tregs induced by IL-35 . IL-35 has also been reported to be expressed by CD8+ Tregs in prostate cancer patients  and some tumor cells . A broad range of cell types can express IL-35 in the context of inflammation . IL-35 binding to its receptor induces phosphorylation of STAT1 and/or STAT4, which mediate many of the immunosuppressive effects of IL-35 [169-171]. The predominant regulatory property of IL-35 is its ability to suppress T cell proliferation and inhibit their effector functions. IL-35 is required for the maximal suppressive activity of Tregs , and its deficiency significantly decreases the ability of CD4+ Tregs to suppress T cell proliferation . Administration of recombinant IL-35 decreases T cell proliferation and cytokine expression , and ectopic expression of IL-35 in conventional CD4+ T cells causes a switch of their phenotype from effector to regulator [161, 166]. Although IL-35 induces the proliferation of Tregs, it also promotes the expression of suppressive IL-10 [172, 173]. Additionally, IL-35 hampers the development and function of Th17 cells, and it mediates the function of regulatory B cells [166, 170, 172, 174]. As mentioned, IL-35 induces a specific Foxp3- Treg cell subset, iTr35, which suppresses immune responses via IL-35 rather than IL-10 or TGF-β [162, 166]. In response to IL-35, CD8+ CTLA-4+ Tregs suppress autologous T cell proliferation in a contact-independent fashion . IL-37 is a newly discovered member of the IL-1 family. As an anti-inflammatory cytokine , IL-37 is expressed at low levels in peripheral blood mononuclear cells (PBMCs), mainly in monocytes and DCs . In general, IL-37 is upregulated by inflammatory stimuli , and it can be induced by various TLR agonists and pro-inflammatory cytokines, including IL-1β, TNF-α, and IFN-γ . However, TGF-β is the most effective stimulus for IL-37 induction, whereas IL-4 and GM-CSF inhibit constitutive IL-37 expression . IL-37 binds to IL-18Rα and exploits IL-1R8 (SIGIRR) to mediate its anti-inflammatory activities in mouse models [179, 180]. P38 MAPK and extracellular signal-regulated kinase (ERK)1/2 pathways may be involved in IL-37 production . IL-37 is known to play a negative role in Th1/Th17 cell responses mediated by human PBMCs, M1 macrophages, or monocyte-induced DCs (moDCs). Human PBMCs treated with a neutralizing anti-IL-37 monoclonal antibody show increased secretion of pro-inflammatory cytokines, such as IL-6, IL-1β, and TNF-α . Similarly, siRNA-mediated silencing of IL-37 elevates IL-6, IL-1β, and TNF-α secretion by PBMCs after stimulation with the TLR ligands LPS or Pam3CSK4 . Conversely, treatment with IL-37 decreases expression of these cytokines in LPS-stimulated M1 macrophages, probably by reducing phosphorylation of p38 MAPK, ERK, and c-Jun N-terminal kinase (JNK) . Moreover, IL-37 treatment significantly inhibits IL-6, IL-1β, TNF-α, and ROS production in LPS-stimulated moDCs . When CD4+ T cells are cocultured with moDCs, administration of IL-37 decreases formation of IL-17 and IFN-γ . Expression of IL-37b in a mouse macrophage cell line reduced the expression of a variety of inflammatory cytokines, and similar results were observed in human monocytic and epithelial cell lines . Thus, IL-37 inhibits the production of pro-inflammatory components in response to inflammatory stimuli. A recent study reported that IL-37 might be involved in peripheral tolerance through generation of semi-mature tolerogenic DCs in a murine contact hypersensitivity model , suggesting another possible cellular mechanism by which IL-37 can regulate the adaptive immune response. As an important regulator of the immune system, autophagy might be expected to affect IL-10 production by macrophages and DCs, and conversely, IL-10 is likely to have many effects on autophagy (Table 1, Figure 2 and Figure 3a). Indeed, there is evidence for both, although the precise regulatory mechanisms involved remain largely elusive. Treatment of murine macrophages with globular adiponectin increases the abundance of autophagic vacuoles visible by transmission electron microscopy, indicative of autophagy induction, and elevates IL-10 mRNA levels . However, the same treatment markedly downregulates IL-10 expression in Atg5-deficient macrophages , revealing a “direct” effect of autophagy on IL-10 expression. In mouse NG108-15 neural cells, addition of amyloid-β25-35 induces autophagosome formation and increases IL-10 levels, whereas IL-10 is significantly reduced by treatment with madecassoside, a triterpenoid saponin compound, or the autophagy inhibitor 3-methyladenine (3-MA) . This report therefore indicates a positive effect of autophagy on IL-10 production. However, whether the reduction in IL-10 (determined by western blotting and ELISA) was the result of direct or indirect effects of autophagy inhibition could not be deduced. In DCs generated from the PBMCs of healthy volunteers, blockade of autophagy with ATG16L1 siRNA or 3-MA decreased IL-10 concentrations in the supernatant and increased T cell proliferation in an allogeneic mixed lymphocyte reaction . Here too, the detailed mechanism by which this occurred was not reported. In contrast to the preceding reports, recent investigations have indicated possible negative effects of autophagy on IL-10 production. The growth factor VEGF165 upregulates Beclin-1 and LC3 expression in LPS-treated spinal neuron-glia co-cultures but decreases IL-1β, IL-10, and TNF-α expression in a manner that was partially blocked by 3-MA . A coding polymorphism in ATG16L1 (threonine 300 to alanine) increases IL-10 and IL-6 expression in monocytes treated with Mycobacterium avium subspecies paratuberculosis , and systemic lupus erythematosus patients carrying an Atg5 gene mutation appear to have an increased ability to produce IL-10 . The latter two reports suggest that impaired autophagy may correlate with elevated IL-10 production and that autophagy may thus negatively regulate IL-10 production. Nevertheless, a solid mechanistic explanation for this is lacking and must await further investigation. In MRC5 human lung fibroblasts subjected to nutrient deprivation or infected with CMV, IL-10 inhibits the autophagic flux via the PI3K/Akt signaling pathway, and this is reversed by induction of autophagy via rapamycin treatment or upregulation of BECN1 gene expression. IL-10 also attenuates autophagy in tumor cells targeted by human peripheral blood lymphocytes (also called lymphocyte-mediated autophagy) . As reported by Park , IL-10 signaling in murine macrophages inhibits autophagy and activates the class I PI3K pathway, which in turn leads to p70S6K phosphorylation through activation of Akt and mTORC1. Infection with HIV-1 blocks rapamycin-induced autophagy in bystander (uninfected) macrophages/monocytes, and this is reversed by neutralization of IL-10 . Exposure of DCs to active or UV-inactivated Kaposi's sarcoma associated herpes virus stimulates STAT3 phosphorylation and increases secretion of IL-10 . The subsequent maintenance of STAT3 phosphorylation by IL-10 correlates with a blockade in autophagy . These reports document the inhibitory effect of IL-10 on autophagy. However, the underlying mechanisms by which the autophagy flux is altered remain to be elucidated. Exploration of this issue may shed new light on immunomodulation. While the majority of reports to date have demonstrated a negative effect of IL-10 on autophagy, Martinez-Outschoorn et al. showed that co-culture of fibroblasts with MCF7 breast cancer cells upregulates IL-10 expression, and further, that IL-10 induces the autophagic response in these cells . Thus, the regulatory effect of IL-10 on autophagy appears to be context dependent. Interactions between TGF-β signaling and autophagy have been reported recently. As an intracellular degradation mechanism, autophagy controls TGF-β signaling in different ways, while TGF-β has been shown to induce autophagy in various cellular contexts. Several recent studies have also indicated that TGF-β can have a negative effect on autophagy (Table 2, Figure 2 and Figure 3b). Interactions between autophagy and inhibitory cytokines. Interactions between autophagy and IL-10 production are context dependent. Autophagy inhibits TGF-β signaling, whereas TGF-β has dual effects on the autophagic flux. IL-27 has been reported to inhibit autophagy. The effects of IL-35 and IL-37 on autophagy remain unknown. Mechanisms involved in the interactions between autophagy and inhibitory cytokines. (a) IL-10 contributes to activation of the JAK-STAT3 and PI3K-Akt-mTORC1 pathways and thus inhibits autophagy. (b) TGF-β induces autophagy through multiple mechanisms, including intervention in the TAK1-MKK3-p38 MAPK signaling pathway and regulation of PED/PEA-15, ROS, and PP2A/FoxO1. However, TGF-β can also inhibit the BECN1 promotor and thus reduce autophagy. Autophagy limits TGF-β production through lysosomal degradation and may negatively regulate TGF-β signaling through p62 degradation. (c) IL-27 activates mTOR and Mcl-1 and negatively regulates autophagy. (d) IL-37 inhibits mTOR and may have potential negative effects on autophagy. Autophagic degradation may play an important role in TGF-β clearance. Ding et al. found that LC3 deficiency resulted in elevation of TGF-β levels in obstructed kidneys . LC3 deficiency also increased TGF-β in human and mouse primary renal proximal tubular epithelial cells, as did bafilomycin A1, an autolysosomal inhibitor . Sirt7 is a member of the mammalian sirtuin family and promotes oncogenic transformation. In cardiac fibroblasts, loss of Sirt7 activates autophagy and downregulates TβRI. Treatment with chloroquine blocked TβRI downregulation . In TGF-β-treated immortalized and tumor-derived epithelial cell lines, the autophagic signaling adaptor p62 was observed to accumulate and stabilize the TGF-β/Smad signaling co-activator Smad4; in this case, p62 accumulation was mainly due to induction of transcription . Though the effects of autophagy on p62 accumulation and Smad4 stabilization were not investigated in this study, it could be hypothesized that autophagy might negatively affect TGF-β signaling through reduction of p62. As a pleiotropic cytokine, TGF-β could regulate autophagy through many different pathways. In 2005, Gajewska et al. reported that treatment of a bovine mammary epithelial cell line with TGF-β1 significantly increased cytoplasmic levels of LC3 and Beclin-1. This was the first report of a potential effect of TGF-β on autophagy. Subsequent reports demonstrated positive effects of TGF-β signaling on autophagy in a variety of cellular contexts. For example, in human hepatocellular carcinoma cell (HCC) lines, TGF-β increased autophagosome formation, LC3 conversion, and Beclin-1, ATG5, ATG7, and death-associated protein kinase (DAPK) mRNA expression . Blockade of TGF-β signaling by knockdown of Smad2, Smad3, or Smad4 attenuated the TGF-β-induced autophagy . Likewise, knockdown of DAPK or inhibition of JNK inhibited autophagy, indicating that both Smad and non-Smad pathways are involved in TGF-β-induced autophagy . In HCC cells, galangin-induced autophagy requires TGF-β signaling, and it is blocked by either downregulation of Smad4 or inhibition of TGF-β receptor activation . In a study of mesenchymal stem cell (MSC)-induced chemoresistance of HCC cells, IFN-γ in combination with TNF-α induced expression of TGF-β in the MSCs and induced autophagy in the HCC cells. Knockdown of TGF-β attenuated the MSC-induced autophagy and chemoresistance in HCC cells . TGF-β1 treatment of mouse mesangial cells enhances the expression of LC3 and suppresses caspase-3 activation, representing an adaptive mechanism to glomerular injury . Serum deprivation causes apoptosis of the rat HSC cell line, and addition of TGF-β1 reduces this through an autophagy-dependent mechanism. Thus, TGF-β1 provides protection against serum deprivation via autophagy induction. Nogo-B deficiency in the rat HSC cell line decreases ER stress and autophagy, and conversely, TGF-β treatment increases Nogo-B expression in a time- and dose-dependent manner . TGF-β has also been reported to induce autophagy in human atrial myofibroblasts , primary mouse and human renal proximal tubular epithelial cells [196, 207], breast cancer tumor stromal cells , human lung fibroblasts , mouse L6 and C2C12 myoblasts [210, 211], human embryonic stem cells , and renal tubules . Multiple mechanisms might be involved the induction of autophagy by TGF-β, including the TAK1-MKK3-p38 MAPK signaling pathway , ROS , PP2A/FoxO1, and PED/PEA15 . Recent studies have shown that TGF-β signaling can inhibit autophagy. In cultured murine early endothelial progenitor cells, TGF-β treatment decreased the density of LC3-II-positive autophagosomes, and this was countered by treatment with the autophagy inducer suberoylanilide hydroxamic acid . Smad2, a key component of TGF-β signaling, was found to target Beclin-1 gene expression and suppress the BECN1 promotor in endothelial cells . 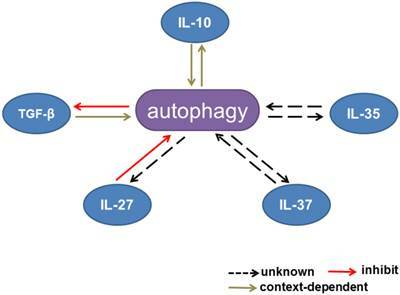 At present, the connections between IL-27 and autophagy are largely unclear. Sharma and colleagues were the first to show that IL-27 inhibits IFN-induced autophagy . They showed that IL-27 downregulated IFN-induced autophagosome generation and phagosome maturation in M. tuberculosis H37Rv-infected macrophages, and suppressed nutrient deprivation-induced autophagy and phagosomal acidification in these cells. As a result, IL-27 effectively promoted survival of the intracellular mycobacteria. Several mechanisms might be involved in this process, including activation of the JAK-PI3K-mTOR pathway and upregulation of the anti-apoptotic protein Mcl-1 (Figure 2 and Figure 3c). However, of all the steps involved in autophagy, IL-27 is perhaps most likely to affect autophagosome formation, and its effects on lysosomal degradation remain unclear. Given that IL-27 activates STAT1 and STAT3, the potential role of these signaling proteins in the effect of IL-27 on autophagy needs further investigation. The molecular mechanisms by which IL-35 exerts its immunosuppressive effects are not well understood, although promotion of Tregs, inhibition of effector T cells, induction of iTr35 cells, and augmentation of IL-10 secretion have all been implicated. Autophagy is a critical process and, under certain circumstances, it may even dictate cell survival or death. Given the increasing evidence that autophagy has substantial effects on the immune system, it would not be surprising if this process were involved in IL-35-mediated immunosuppression at the molecular and subcellular levels. Although there is currently no evidence that IL-37 and autophagy do interact, some clues about this can be gleaned from the literature. Transfection of the human monocytic cell line THP-1 with IL-37b reduces expression of mTOR , and IL-37 plus IL-1R8 induce a starvation-like effect on mTOR  (Figure 2 and Figure 3d). 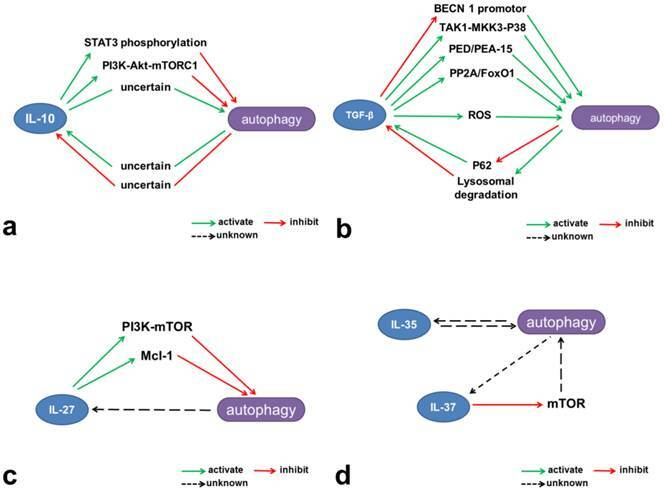 mTOR is a metabolic checkpoint kinase and upstream regulator of autophagy, and has direct effects on ULK1 and the initiation of autophagy. Thus, it will be interesting to investigate the effects of IL-37 on autophagy, particularly with respect to the mTOR/ULK1 complex pathway. Recent work has demonstrated that autophagy plays an important role in the immune response. As mentioned, autophagy serves as the effector mechanism for PPRs, inhibits inflammasome formation, and promotes MHC class II-mediated antigen presentation and cross-presentation. In addition, autophagy is induced by several pro-inflammatory cytokines and is reduced by Th2-associated cytokines. Reciprocally, autophagy is involved in regulating the production and degradation of cytokines. The interaction between autophagy and cytokines is an emerging topic in immunology. Since inhibitory cytokines are crucial for maintaining immune homeostasis, the interactions between inhibitory cytokines and autophagy may have profound implications for the immune system, and could suggest new strategies for the treatment of autoimmune diseases, infection, tumors, and even severe trauma. However, it is clear from the literature that there are still large gaps in our understanding of this field. First, theoretically, autophagy may play a dual role in the regulation of cytokines. Enhanced production of cytokines is usually accompanied by an increasing need for energy and subcellular material for cytokine synthesis, both of which may intrinsically stimulate autophagy. Under normal circumstances, autophagy contributes to energy production and recycling of cellular material, and a deficit in autophagy may result in ATP depletion. However, autophagy is also an important mechanism for cytokine degradation, so increasing the process may promote a reduction in cytokines. The overall effect will thus depend on the equilibrium between cytokine production and degradation, and it may be controlled by a highly complex and mostly unknown signal transduction network. Second, to date, studies of autophagy have mainly focused on the formation of autophagosomes, which is the characteristic structure of autophagy. However, autophagosome formation is only one part of the autophagic flux. Degradation in autolysosomes is the ultimate fate of autophagic cargo and this step demands more attention. Third, the spectrum of cell types in which autophagy-inhibitory cytokine interactions have been investigated needs to be expanded. For example, whether IL-10 and autophagy interact in T cells is unknown, and the effects of TGF-β on autophagy in lymphocytes need further investigation. In this regard, more effort should be devoted to the newcomers in this area, IL-35 and IL-37. From a clinical perspective, autophagy modulators such as rapamycin, resveratrol, and chloroquine have been widely administered to patients for treatment of various disorders, including cancer, transplantation rejection, and infection. Activation or inhibition of autophagy will endow novel therapeutic applications to these conventional pharmaceutical agents and may provide benefits with relatively few risks. Therefore, therapeutic manipulation of the interactions between autophagy and inhibitory cytokines might represent a novel method of regulating the immune response and a more facilitated clinical translation. ATG: autophagy-related proteins; TGF: transforming growth factor; ULK1: Unc-51-like kinase 1; mTOR: mammalian target of rapamycin; PI3K: phosphatidylinositol 3-kinase; UVRAG: UV irradiation resistance-associated gene; PE: phosphatidylethanolamine; PRR: pattern recognition receptor; IFN: interferon; TNF: tumor necrosis factor; TLR: Toll-like receptor; NLR: (NOD)-like receptor; RLR: (RIG-1)-I-like receptor; PAMPs: pathogen-associated molecular patterns; ROS: reactive oxygen species; SLRs: sequestosome-1/p62-like receptors; LPS: lipopolysaccharide; APC: antigen presentation cell; MHC: major histocompatibility complex; STAT: signal transducer and activation of transcription; MAPK: mitogen-activated protein kinase; DC: dendritic cell; GM-CSF: granulocyte-macrophage colony-stimulating factor; Foxp3: Fork head box 3; PBMC: peripheral blood mononuclear cells; ERK: extracellular signal-regulated kinase; moDC: monocyte-induced dendritic cell; JNK: c-jun amino-terminal kinase; HCC: hepatocellular carcinoma cell; DAPK: death-associated protein kinase; MSC: mesenchymal stem cell. This study was supported, in part, by grants from the National Natural Science Foundation of China (Nos. 81130035, 81372054) and the National Basic Research Program of China (No. 2012CB518102).